On the 22nd of November, 2013, the 50th anniversary of his death, C.S. Lewis was formally recognized as one of the great figures of English letters, with his Memorial in Poets’ Corner of Westminster Abbey placing him in the company of such literary stars as Shakespeare and Chaucer and Austen. 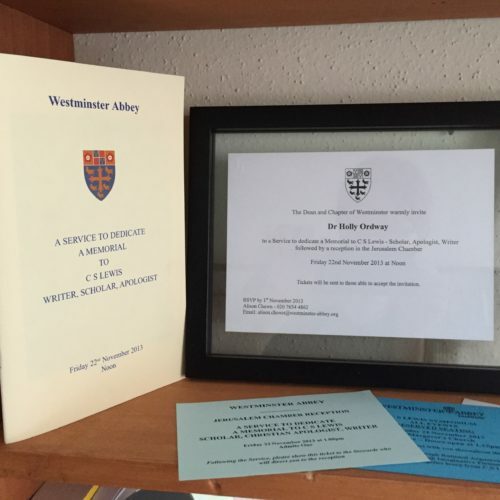 I had the very great privilege of being present at the Memorial Service, and now I am delighted and honored to have my reflection on that day included in the book C.S. 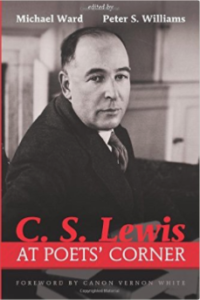 Lewis at Poets’ Corner – edited by Michael Ward, who masterminded the Memorial project from start to finish, and Peter S. Williams. It’s a book that captures the glorious variety of the commemorative celebrations around the historic 50th anniversary of Lewis’s death – a fitting way to honor the genius of Lewis, who wrote in so many different genres and forms, and to continue his legacy as a scholar, apologist, and writer. As I reflected on all these events, I found myself particularly recalling the joyful experience of hearing, at the Memorial Service, the very first performance of Paul Mealor’s setting of Lewis’s poem “Love’s as Warm as Tears” – a deeply moving composition for a beautiful poem. When I remembered that November 22 is also the feast day of Saint Cecilia, patron of music, I turned to poetry to express something of the meaning of that day – and here is the result. And pure, almost solid to the touch. In recollection it remains as bright.